The premiere on Broadway was in 1950. It ran for 1,200 performances and won the Tony Award for Best Musical. The musical has had several Broadway and London revivals, as well as a 1955 film adaptation starring Marlon Brando, Jean Simmons, Frank Sinatra and Vivian Blaine. 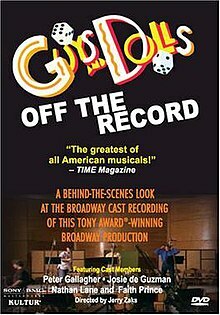 Guys and Dolls was conceived by producers Cy Feuer and Ernest Martin as an adaptation of Damon Runyon's short stories. These stories, written in the 1920s and 1930s, concerned gangsters, gamblers, and other characters of the New York underworld. Runyon was known for the unique dialect he employed in his stories, mixing highly formal language and slang. Frank Loesser, who had spent most of his career as a lyricist for movie musicals, was hired as composer and lyricist. George S. Kaufman was hired as director. When the first version of the show's book, or dialogue, written by Jo Swerling was deemed unusable, Feuer and Martin asked radio comedy writer Abe Burrows to rewrite it. The character of Miss Adelaide was created specifically to fit Vivian Blaine into the musical, after Loesser decided she was ill-suited to play the conservative Sarah. When Loesser suggested reprising some songs in the second act, Kaufman warned: "If you reprise the songs, we'll reprise the jokes." A pantomime of never-ceasing activities depicts the hustle and bustle of New York City ("Runyonland"). Three small-time gamblers, Nicely-Nicely Johnson, Benny Southstreet, and Rusty Charlie, argue over which horse will win a big race ("Fugue for Tinhorns"). The band members of the Save-a-Soul Mission, led by the pious and beautiful Sergeant Sarah Brown, call for sinners to "Follow the Fold" and repent. Nicely and Benny's employer, Nathan Detroit, runs an illegal floating crap game. Due to local policeman Lt. Brannigan's strong-armed presence, he has found only one likely spot to hold the game: the "Biltmore garage." Its owner, Joey Biltmore, requires a $1,000 security deposit, and Nathan is broke ("The Oldest Established"). Nathan hopes to win a $1,000 bet against Sky Masterson, a gambler willing to bet on virtually anything. Nathan proposes a bet he believes he cannot lose: Sky must take a woman of Nathan's choice to dinner in Havana, Cuba. Sky agrees, and Nathan chooses Sarah Brown. At the mission, Sky claims he wants to be saved, impressing Sarah with his knowledge of the Bible. He offers Sarah a deal: He will bring the mission "one dozen genuine sinners" if she will accompany him to Havana the next night. Sarah rebuffs him, telling him that she plans to fall in love with an upright, moral man. Sky replies that he plans on being surprised when he falls in love ("I'll Know"). Sky kisses Sarah, and she slaps him. Nathan goes to watch his fiancée of 14 years, Adelaide, perform her nightclub act ("A Bushel and a Peck"). After her show, she asks him, as she has many times before, to go down to city hall and get a marriage license. She also tells Nathan that she has been sending her mother letters for twelve years claiming that they have been married with five children. She is distraught to find out that Nathan is still running the crap game. She consults a medical book, which tells her that her chronic cold is a psychosomatic reaction to her frustration with Nathan's failure to marry her ("Adelaide's Lament"). The next day, Nicely and Benny watch as Sky pursues Sarah, and Nathan tries to win back Adelaide's favor. They declare that guys will do anything for the dolls they love ("Guys and Dolls"). General Cartwright, the leader of Save-a-Soul, visits the mission and explains that she will be forced to close the branch unless they succeed in bringing some sinners to the upcoming revival meeting. Sarah, desperate to save the mission, promises the General "one dozen genuine sinners", implicitly accepting Sky's deal. The gamblers, including a notorious gangster from Chicago named Big Jule, are waiting for Nathan to secure the spot for the game, and Lt. Brannigan becomes suspicious. To convince him of their innocence, they tell Brannigan their gathering is Nathan's "surprise bachelor party". This satisfies Brannigan, and Nathan resigns himself to eloping with Adelaide. Adelaide goes home to pack, promising to meet him after her show the next afternoon. The Save-A-Soul Mission band passes by, and Nathan sees that Sarah is not in it; he realizes that he lost the bet and faints. In a Havana nightclub, Sky buys a drink for himself and a "Cuban milkshake" for Sarah. She doesn't realize that the drink contains Bacardi rum, and innocently drinks multiple glasses, becoming progressively tipsier. Outside the club, Sarah kisses Sky and proclaims that she is truly enjoying herself for the first time in her life ("If I Were a Bell"). She wants to stay in Havana with Sky. Sky is surprised to find, though, that he truly cares about Sarah's welfare, and he insists that they go back to the airport and return to New York. Back in New York, it is 4:00 a.m., and as Sky and Sarah (now sober) stand in the street outside the mission, Sky tells her that this is his favorite time of day, and that she is the only woman he's ever wanted to share it with ("My Time of Day"). They both spontaneously admit that they're in love ("I've Never Been in Love Before"). A siren sounds and gamblers run out of the mission, where Nathan has been holding the crap game. Sarah infers that Sky took her to Havana and pretended to be in love with her just so Nathan could use the mission for the game, rejecting his protests of innocence. Sarah admits to Arvide, her grandfather and fellow mission worker, that she loves Sky but will never see him again because she believes he is responsible for the previous night's crap game. Arvide expresses his faith in Sky's inherent goodness and urges Sarah to follow her heart ("More I Cannot Wish You"). Sky tells Sarah he intends to deliver the dozen genuine sinners for the revival. She doesn't believe him and walks off, but Arvide subtly encourages him. Nicely shows Sky where the game is being held: the sewer ("Crapshooters Dance"). Big Jule has lost a large amount of cash and insists on playing on credit. To change his luck he uses his own dice, which are blank, and proceeds to cheat Nathan out of all of his money. Sky then arrives with Nicely. Big Jule isn't impressed, but Sky responds by punching him out. He then gives Nathan $1,000, saying that Nathan won the bet and implying that Sarah refused to go to Havana with him. Sky, determined to get the dozen sinners he promised Sarah, bets everyone at the game a thousand dollars against their souls. If he loses, every man gets a thousand dollars; if he wins, they must all attend the revival at the mission ("Luck Be a Lady"). He tosses the dice. The gamblers head towards the mission, and it is clear that Sky has won his bet. On his way there, Nathan runs into Adelaide and tells her that he has to attend the prayer meeting. Adelaide does not believe him. She asks herself why she keeps putting up with Nathan's lies, and he tells her that he loves her ("Sue Me"). Sky and the gamblers arrive at the mission, much to Sarah's surprise. General Cartwright asks if anyone wishes to testify to their sins. Benny and Big Jule do, but another gambler named Harry The Horse lets slip that Sky only got them to the meeting because he won their souls in a dice game. The General is very pleased by this as it shows that good can come out of evil. Attempting to appear contrite, Nicely invents a dream that encouraged him to repent, and the gamblers join in with revivalist fervor ("Sit Down, You're Rockin' the Boat"). Brannigan arrives and threatens to arrest everyone for the crap game in the Mission, but Sarah clears them, saying that none of the gamblers were at the mission the previous night. After Brannigan leaves, Nathan confesses that they held the crap game in the mission. He also confesses to the bet he made with Sky about taking Sarah to Havana. He adds that he won the bet, to Sarah's shock, and she realizes that Sky wanted to protect her reputation and must genuinely care about her. Sarah and Adelaide run into each other, and they commiserate and then resolve to marry their men anyway and reform them later ("Marry the Man Today"). Several weeks later, Nathan has opened a newsstand. Sky and Sarah have just been married, and Sky is playing the drum in the mission band. Adelaide and Nathan are about to get married at the mission, and Sky tells Nathan he'll lay eight to ten odds that he will be very happy. 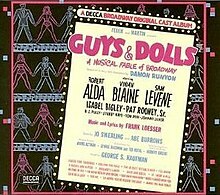 The title song is reprised ("Guys and Dolls" (Finale/Reprise)). The musical premiered on Broadway at the 46th Street Theatre (now Richard Rodgers Theatre) on November 24, 1950. It was directed by George S. Kaufman, with dances and musical numbers by Michael Kidd, scenic and lighting design by Jo Mielziner, costumes by Alvin Colt, and orchestrations by George Bassman and Ted Royal, with vocal arrangements by Herbert Greene It starred Robert Alda (Sky), Sam Levene (Nathan), Isabel Bigley (Sarah), and Vivian Blaine (Adelaide). Iva Withers was a replacement as Adelaide. The musical ran for 1,200 performances, winning five 1951 Tony Awards, including the award for Best Musical. Decca Records issued the original cast recording on 78 rpm records, which was later expanded and re-issued on LP, and then transferred to CD in the 1980s. The show closed on February 13, 1977, after 12 previews and 239 performances. A cast recording was released subsequent to the show's opening. The production received a rave review from Frank Rich in The New York Times, stating "It's hard to know which genius, and I do mean genius, to celebrate first while cheering the entertainment at the Martin Beck." It received eight Tony Award nominations, and won four, including Best Revival, and the show also won the Drama Desk Award for Outstanding Revival. This revival featured various revisions to the show's score, including brand new music for the "Runyonland", "A Bushel and a Peck", "Take Back Your Mink" and "Havana". The orchestrations were redesigned by Michael Starobin, and there were new dance arrangements added to "A Bushel and a Peck" and "Take Back Your Mink". Talawa Theatre Company and Manchester's Royal Exchange Theatre produced the UK's first all-black Guys and Dolls in 2017. The production opened on December 2, 2017 and following an extension will run to February 27, 2018 at the Royal Exchange in Manchester. The cast includes Ray Fearon as Nathan Detroit, Ashley Zhangazha as Sky Masterson, Abiona Omonua, and Lucy Vandi. In this production, the musical was relocated to Harlem, 1939, with the music referencing jazz, and gospel. Director Michael Buffong said, "Pre-war Harlem was all about the hustle. The creativity of that era was born from a unique collision of talent and circumstance as people escaped the agricultural and oppressive south via the 'underground railroad' into the highly urbanised and industrialised north. Much of our popular culture, from dance to music, has its roots in that period. Our Guys and Dolls brings all of this to the fore." Reviews particularly praised the music, relocation to Harlem, and sense of spectacle: The Guardian noted, "the gamblers ... are a bunch of sharp-suited peacocks clad in rainbow hues." The Times commented, "Whoever had the idea of moving this classic musical from one part of New York to another bit, just up the road, needs to be congratulated. This version of Frank Loesser's musical, which swirls around the lives of the petty gangsters and their 'dolls' who inhabit New York's underbelly, moves the action to Harlem at its prewar height in 1939. It is a Talawa production with an all-black cast and it is terrific from the get-go." The Observer stated, "Relocated to Harlem, this fine new production of Frank Loesser's classic musical retains a threat of violence under a cartoon-bright exterior." Charles Randolph-Wright directed a production at Washington's Arena Stage, starring Maurice Hines (Nathan Detroit) and Alexandra Foucard (Adelaide), opening on December 30, 1999. The production received six Helen Hayes Award nominations. With support from Jo Sullivan Loesser, the production began a national tour in August 2001. The cast recording from this production, released in November 2001, was nominated for the Grammy Award for Best Musical Show Album. In April 2014, a one-night-only performance took place at Carnegie Hall, starring Nathan Lane reprising the role that made him a star, Megan Mullally, Patrick Wilson and Sierra Boggess. It was directed by Jack O'Brien and featured the Orchestra of St. Luke's playing the original orchestrations. The original Broadway production of Guys and Dolls opened to unanimously positive reviews. Critics praised the musical's faithfulness to Damon Runyon's style and characterizations. Richard Watts of the New York Post said "Guys and Dolls is just what it should be to celebrate the Runyon spirit ... [it is] filled with the salty characters and richly original language sacred to the memory of the late Master". William Hawkins of the New York World-Telegram & Sun stated, "It recaptures what [Runyon] knew about Broadway, that its wickedness is tinhorn, but its gallantry is as pure and young as Little Eva". Robert Coleman of the New York Daily Mirror declared, "We think Damon would have relished it as much as we did". The book and score were greatly praised as well; John Chapman of the New York Daily News declared, "The book is a work of easy and delightful humor. Its music and lyrics, by Frank Loesser, are so right for the show and so completely lacking in banality, that they amount to an artistic triumph". Coleman stated, "Frank Loesser has written a score that will get a big play on the juke boxes, over the radio, and in bistros throughout the land. His lyrics are especially notable in that they help Burrows's topical gags to further the plot". In The New York Times, Brooks Atkinson wrote, "Mr. Loesser's lyrics and songs have the same affectionate appreciation of the material as the book, which is funny without being self-conscious or mechanical". 20th Century Fox acquired the film rights to the musical in early 2013 and was planning a remake. In March 2019, TriStar Pictures acquired the remake rights. ^ a b Nadel, Ira Bruce. Double act: a life of Tom Stoppard. Methuen, 2002. p. 542. ^ "Damon Runyon". Authors. The eBooks-Library. Retrieved 2008-07-20. ^ a b Zolotow, Maurice. "Guys, Dolls and Runyon". The New York Times, Nov. 12, 1950, Section 2, p. 1,3. ^ Herrmann, Dorothy (1982). With Malice Toward All. New York: G. P. Putnam's Sons. pp. 60–61. ^ Norton, Richard C. A Chronology of American Musical Theater: 1952 - 2001, Volume 3 Oxford Univ. Press, 2002. p. 33. ^ "Guys and Dolls (City Center Revival, 1955)" broadwayworld.com 2011. Last accessed 22 Mar 2011. ^ Eyre, Richard. "Directing the National Theatre Guys and Dolls." In: Loesser, Frank, et al. The Guys and Dolls Book. Methuen, 1982. p. 36. ^ Mordden, Ethan. Broadway Babies: The People Who Made the American Musical. Oxford University Press US, 1988. p. 230. ^ Battersby, Kate. "The Cast Were in Shock at the Avalanche of Appreciation." The Telegraph. May 31, 2005. ^ Kullman, Colby H. and William C. Young. Theatre Companies of the World, Volume 1. Greenwood Press, 1986. p. 691. ^ "Huge Team Help Stage Revival of Broadway's Guys and Dolls." The Bath Chronicle. April 21, 2011. ^ Scottish Field, Volume 131. Holmes McDougall, 1985. ^ Benedict, David. "Good Night, Sweet Prince." The Independent. 6 January 1995. ^ Vincentelli, Elisabeth. "This Revival is a Bad Bet: Guys & Dolls Bores in Broadway Return." New York Post. March 2, 2009. ^ Lahr, John. "Broadway Boogie-Woogie: Guys and Dolls Rolls the Dice Again." The New Yorker. March 9, 2009. ^ "Full casting announced for Guys and Dolls at the Savoy Theatre in London's West End". www.londontheatre.co.uk. Retrieved 2016-01-15. ^ "GUYS AND DOLLS Confirmed to Transfer to the Phoenix Theatre!". Retrieved 2016-01-29. ^ Boehm, Mike. “A 'Guys and Dolls' Just Like Harlem” latimes.com, April 14, 2002. ^ Jones, Kenneth, and Robert Simonson. “Indian Ink, Cabaret Lead 2000 Helen Hayes Award Winners” playbill.com, May 9, 2000. ^ Simonson, Robert, and Christine Ehren. “Arena Stage Guys and Dolls to Tour U.S. Starting Fall 2001; Goal Is Bway” playbill.com, Jan. 23, 2001. ^ Simonson, Robert. “National Tour of Hines Guys and Dolls to Begin Aug. 28” playbill.com, May 10, 2001. ^ Jones, Kenneth, and Robert Simonson. “Still Rockin' the Boat: Touring Guys and Dolls Gets Cast Album Nov. 6” playbill.com, Nov. 6, 2001. ^ Gans, Andrew. “Bernadette Peters, Hairspray and Millie Among Grammy Nominees” playbill.com, Jan. 7, 2003. ^ Mahoney, Elisabeth. "Guys and Dolls – Review: New Theatre, Cardiff". The Guardian. 16 March 2011. ^ "Stand Up, They're Rocking the Boat, Like 1950 Again : 'Guys and Dolls' Is Performed as a Benefit for Carnegie Hall". The New York Times. Retrieved 2014-06-06. ^ Fleming Jr., Mike "Fox Seals ‘Guys And Dolls’ Rights; Wants Channing Tatum, Joseph Gordon-Levitt To Fill Frank Sinatra And Marlon Brando Shoes." Deadline Hollywood (April 24, 2013). ^ Brett Lang; Justin Kroll. "'Guys and Dolls' Getting Remade at TriStar (EXCLUSIVE)". Variety. Retrieved 26 March 2019. Wikimedia Commons has media related to Guys and Dolls (musical).